So as most of you are aware Fantasy Flight Games have announced the newest Star Wars RPG. A hardcopy beta is circulating in many FLGS at a pricey $35. There has been a few pieces of information released about the game now so here's a quick summary. FFG have said these are independent game lines that will share a unified system, which must be good news to those of us who bought into the 40K lines with the slightly different rule systems. To date only the beta book is available, and only in hardcopy from your FLGS. FFG did give it out and sell it at GenCon this year but they are now out of stock. Custom dice. Oh how many of us hate custom dice. 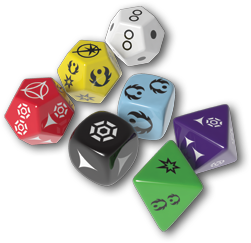 Yes the new Star Wars line will be using custom dice meaning ans you either have to buy more dice for the game in some manner, or obtain stickers for your existing dice (or assign a number to each custom effect, but who wants to do that?) FFG have already released an app to be used as a dice roller for both Android and iOS ($4.99 each) so the dice aren't really necessary. It seems that the tokens are just placeholder tokens to represent characters and vehicles on maps. Beginner Game is to retail for $29.95. The core rulebook has also been announced but no word on a street date, size or price.